"Starlings isn't really a short-story collection. It's something better: a written showreel, illustrating yet again that [Walton's] imagination stretches to the stars (or the starlings), and that she's endlessly inventive in finding new methods to express it." --NPR Books. An ancient coin cyber-spies on lovers and thieves. The magic mirror sees all but can do nothing. A cloned savior solves a fanatically-inspired murder. Three Irish siblings thieve treasures with bad poetry and the aid of the Queen of Cats. With these captivating initial glimpses into her storytelling psyche, Jo Walton shines through subtle myths and reinvented realities. Through eclectic stories, subtle vignettes, inspired poetry, and more, Walton soars with humans, machines, and magic--rising from the every day into the universe itself. "Starlings isn't really a short-story collection. It's something better: a written showreel, illustrating yet again that [Walton's] imagination stretches to the stars (or the starlings), and that she's endlessly inventive in finding new methods to express it." 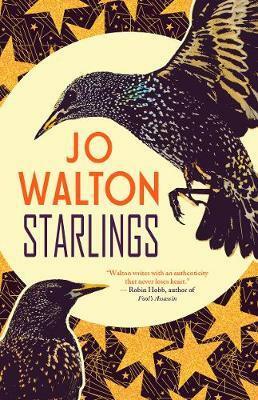 "Starlings is a showcase of Jo Walton's diverse talents--a collection too varied to be summed up in a few words. From fairytale fantasy to hard science fiction, from laugh-aloud play script to finely crafted poetry, with a writing experiment or two thrown in, Starlings should delight Walton's existing fans and garner many new ones." "Stephen King once wrote that 'a short story is like a kiss in the dark from a stranger'--that is, sudden, pleasant, mysterious, dangerous and exiting--and the collected short fiction of Jo Walton is exemplary of the principle." "Displays Walton's formidable erudition, and her fascination with the various forms stories can take . . . Starlings as a whole may be the most interesting anatomy of that imagination than we've yet seen in one volume." "Jo Walton's short writings have for decades been among the things that make the Internet worthwhile. She makes science fiction illuminate life. This collection lives up to its title: iridescent, dark, gregarious, talkative and ever ready to fly up." "Walton's diverse collection of stories and poems sparkles with originality and fun. The joy of this book will linger with me for a while." "Jo Walton's delightful collection, Starlings, runs the gamut from homemade fairy tales to hard-boiled cloned-Jesus detectives (just wait for the shaggy dog); to a play with figures out of Irish myth, and a talking dragon; to a selection of her fantastic poems. It's the kind of collection you can glide through, often while laughing out loud." "One of the things I love about Walton's work is her range of human possibility, from laughter to horror, but above all a reveling in profligate beauty. This collection celebrates the best in the human spirit." "Reading this collection felt like watching a wizard at the cauldron having fun with new spells . . . I recommend this collection to anyone who enjoys fantasy, Jo Walton's previous works, or wants to try shorter works before committing to longer ones." "This collection of fiction and poetry from Hugo- and Nebula-winner Walton (The Just City) showcases her trademark focus on genre and philosophical questions . . . fans of the [short] form will have plenty to appreciate." "I recommend Starlings to lovers of science fiction and fantasy who want bite-sized pieces to enjoy and savor. It's an eclectic mix of themes and tones, some humorous and some dark, that will keep you guessing." "As varied, as skilled, as intriguing as her novels, this is a stunning collection of stories, vignettes, poetry and more." "Coupled with Walton's frank self-assessments, the collection offers an incredible sense of intimacy. It's the closest we'll come to understanding how Jo Walton's dizzying writer's mind ticks along, and how her imagination flows. It's a rare opportunity, to peek in on the inventor in her workshop. Starlings is revelatory not only as a collection of fiction, but as a sort of biography of the process of writing itself. Fascinating." "5/5 stars. There wasn't anything that I didn't like about [Starlings]. It ticked all boxes for me." "A wild and wonderful imagination at work." "A master class in studying technique, form, and ending stories with zingers." "This prolific writer can indeed write great stories in a wide range of topics and tones."